Give me a C, give me an 0, give me a U, - you've got it! 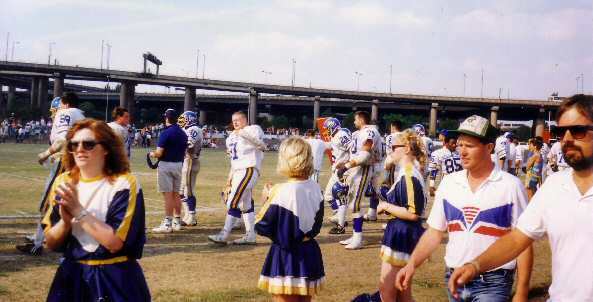 The Leeds Blue Cats are the Cheerleader squad on the sidelines at all Cougar games as they attempt to encourage the players and supporters with their well rehearsed routines. They are a welcoming sight and are every bit as dedicated as the men they cheer on. As long as I can remember they have always been there, not always the same faces, and on one occasion they went under a different name (does anyone remember 'The Chuckettes'?) but nevertheless the blue and gold colours have a reassuring air about them. With the advent of the game in this country, female fans, wives and girlfriends of the players began to follow the domestic game, having seen the American version on television. The razzmatazz of the American game was an obvious big attraction and wishing to become more involved many teams suddenly found themselves with Cheerleader squads as the girls attempted to become part of the action. The girls carry out their duties for the pure enjoyment of the game and there's a big difference between cheering for a team on this side of the Atlantic to cheering in the 'States. The whole business is better established over there and to some extent is built on glamour. Cheerleaders can use their time on the sidelines as a stepping stone towards advancement in their careers, and it must be remembered that Cheerleading for the NFL teams is a full time paid profession. On the other hand, the British Cheerleaders art is still in its infancy and it's not particularly glamorous as yet, although the lost few years have seen the emergence of competitions and championships in an attempt to gain public awareness. Conditions are not particularly good, with little in the way of sponsorship which, as the girls mostly have to finance themselves, bears great testimony to their dedication and commitment. Sitting in the stands it is all too easy to dismiss the Cheerleaders as just another part of the games entertainment but next time you see the Blue Cats in action spare a thought as to just what it takes to be a member of the squad. Basically it takes a lot of commitment, a lot of time and a lot of hard work. Regular practices have to be attended, routines and chants have to be learned thoroughly and they have to be fit with a lot of stamina - Remember, the Cheerleaders are in action for the full sixty minutes plus pre-game and half-time routines! All this would be hard enough, but then they have to have the confidence to carry out the routines before a large boisterous crowd, wearing what can only be described as a rather skimpy outfit. Things do not always go according to plan either, as more than once the music for a routine has been mis-cued and a recent survey on the weather indicates that the best days fall mid-week with the odds for the worst weather being heavily stacked in favour of Sunday. The Blue Cats can surely confirm this as the number of times they perform routines in the pouring rain are too many to recount but true to the dedication shown throughout the club they just get on with the job in hand. The girls need to have a basic knowledge concerning the game as only those who understand what is happening on the field can realise when that little extra bit of encouragement is required or when they need to keep quiet, as in the case of injuries. Many teams have seen their Cheerleading squads lose interest with the result that they have ceased to operate, an action they must now surely regret. Travelling squads of Cheerleaders are now being hired for games, but with no specific allegiance to the team how can the fans identify with them? The Cougars on the other hand believe in complete integration of all elements and the Blue Cats have become part of the family, well liked and respected. They have appeared at various functions and events as they continue to publicise themselves and the team, and they have even been asked to Cheer at the Home Games of Leeds United FC. In conclusion, the Blue Cats are every bit as important as all the other segments of the club although they don't always receive the recognition they should. Hopefully we have outlined the hard work and dedication required, so the next time they go through their routines let's give them the hand they deserve.